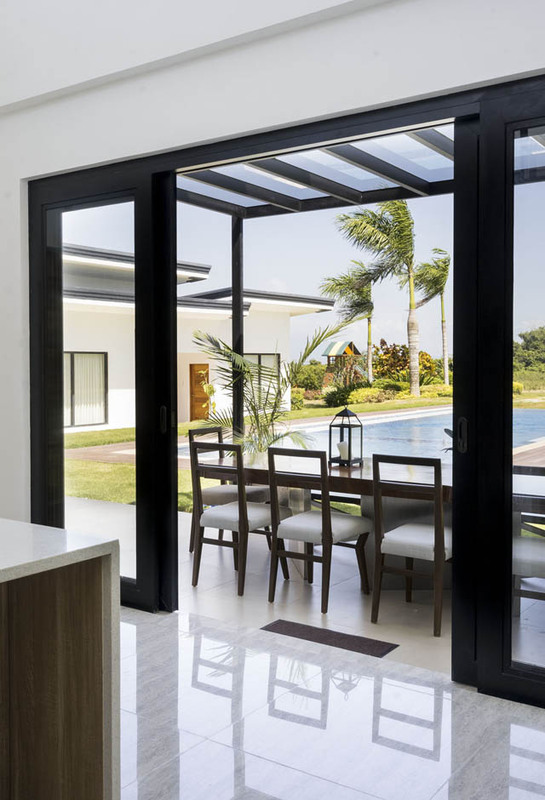 This sprawling Batangas house is so conducive to lounging that decorator Gwyn Guanzon can’t help but plop himself on a chair in the lanai facing the swimming pool. 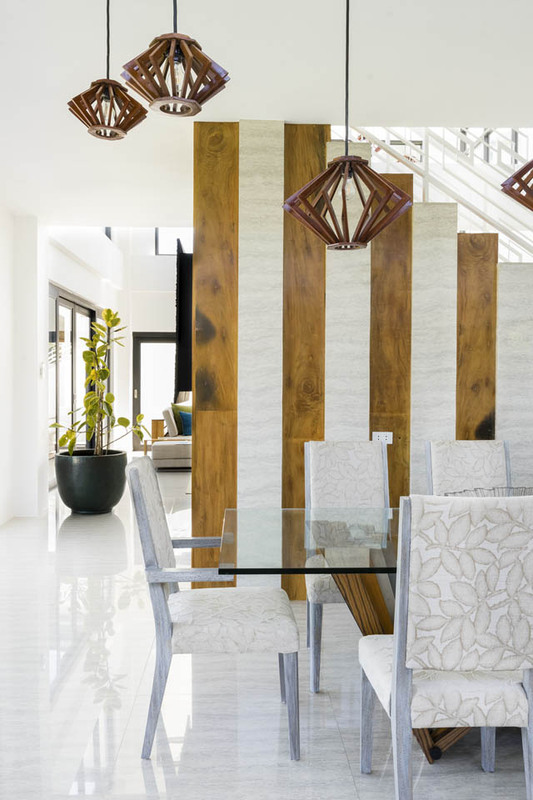 The approximately 1,200-sqm weekend house for a family of five is Gwyn’s most spacious project to date. Yet in spite of its ample proportions, the property is decidedly more inviting and less imposing, thanks to the abundance of open spaces and Gwyn’s signature playful decorating flair. “Masarap tambayan ang bahay na ito. ‘Yon naman ang point,” says Gwyn. And to that, the homeowners (and their guests) would agree. Everything comes together in the show-stopping living area, which features interplay of textures and materials, as well as pops of jewel tones. A niche becomes a focal point with its granite-print wallpaper serving as backdrop to the vignette of upholstered chairs and hourglass side tables. The aforementioned high ceiling serves as a backdrop to the custom “spider” droplights. 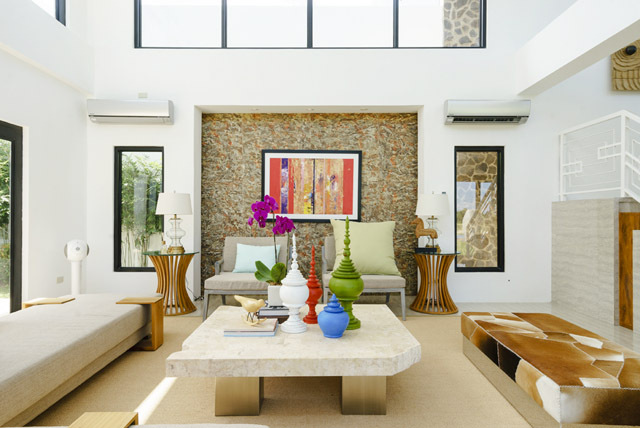 Colors, textures, and materials are celebrated in the living room. Symmetry is prominent as well on either sides of the niche. There are side tables, lamps, a bright abstract, lounge chairs, and small transom windows. 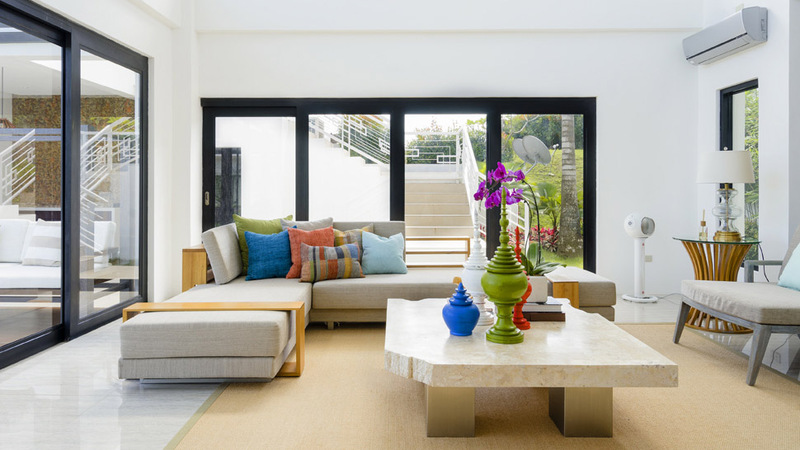 The massive coffee table, sofas, and armchairs were customized by Asian Tropical Lifestyle, a furniture manufacturer in Pampanga. The homeowners only had a few specific requests, one of which was to have a patterned fabric for the dining room upholstery. Gwyn decided on a tactile floral motif in neutral. The finish of the dining chairs is noticeable, as well as the truncated armrests. 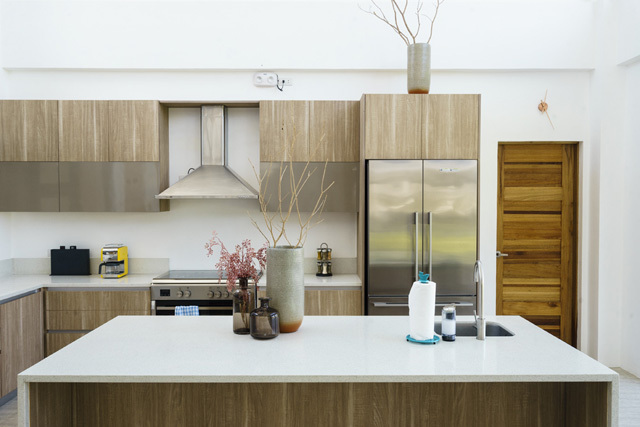 The large and sleek kitchen with matching island and stainless steel accoutrements is by The Canadian Kitchen Company, tel. (02) 6714495 and 9142. As in almost every area of the house, the kitchen opens up directly to the outdoor dining area that faces the swimming pool and deck. The 12-seater dining set was designed by Gwyn and customized by Asian Tropical Lifestyle. 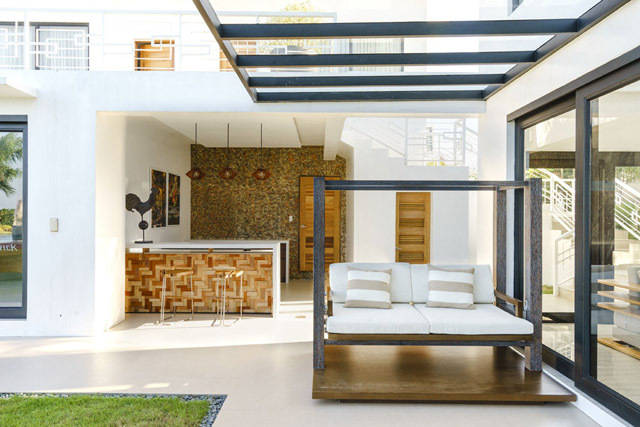 Just right outside the living area is this outdoor bar with a generously sized daybed—two features which are more commonly found in hotel poolsides, and not in a home. Gwyn lightheartedly relates when, during construction, they would drive from Manila to the site with a vehicle full of furnishings. Once the new pieces have been appropriated to their proper areas, it didn’t look like these made any difference at all, space-wise. “These are not my typical colors,” Gwyn says of the serene blue-and-green palette in the boy’s bedroom. The blue, in particular, is a distinctly exquisite shade that’s neither boyish nor too masculine. The color also worked well with the textile for the bespoke deep couch. 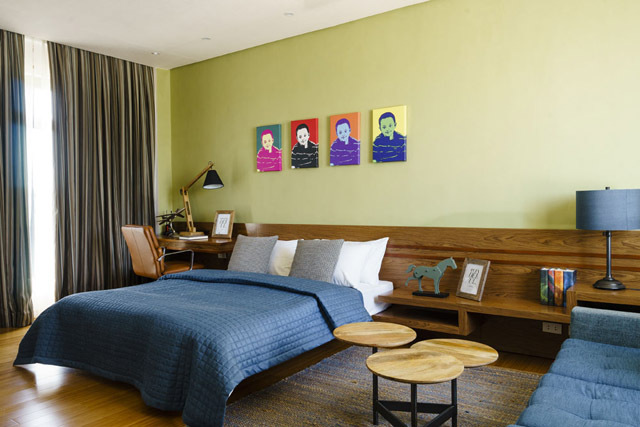 A wooden panel serves as the headboard and connects to the modular desk. The bedroom for the family’s little girl is properly furnished with a four-poster bed with a padded headboard in subtle old rose, no less. 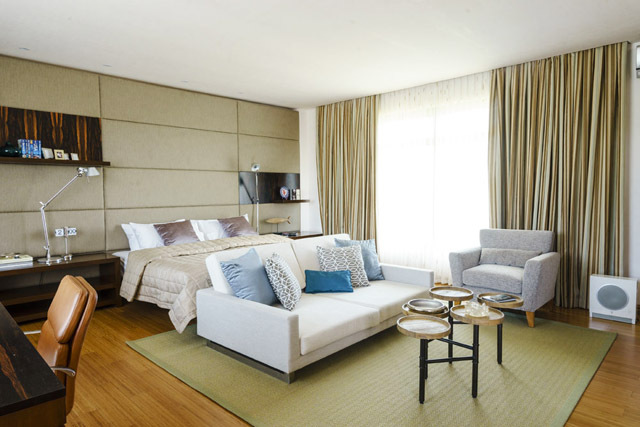 Gwyn admits this is the sweetest bedroom he has designed thus far, referring to the delightful mural of cherry blossoms by Barbara Opida and Gian Gianan. Gwyn incorporated more of the house’s common decorative elements in the bedrooms: wallpapered ceiling, a bamboo rug, and a sleeper couch that moonlights as an extra bed. All three well-appointed bedrooms also have quilted beddings made of Jim Thompson silk. Gwyn muses about the massive size of the furnishings—these pieces are large in scale, and perhaps gargantuan by condo standards, but they all fit perfectly in this home. Read the original article ("Out In The Open") in the February issue of Real Living Magazine. Download your digital copy of Real Living on the Real Living App. Log on to summitnewsstand.com.ph/real-living for more details.